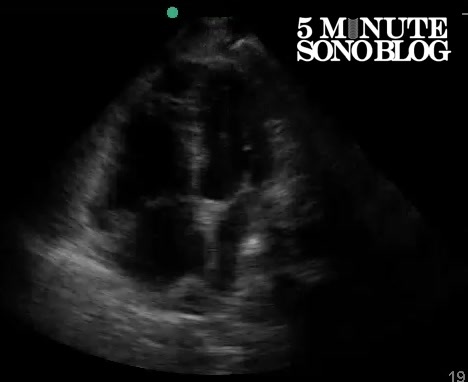 When most people think about ultrasound and pulmonary embolus (PE), they think about a specific echocardiographic finding called right heart strain (RHS). RHS is defined as volume or pressure overload of the right ventricle causing hemodynamic compromise, and is detected by seeing right heart enlargement on echo. The theory is that if you have a sick patient and you see right heart strain, you can assume the presence of a large PE and should therefore consider thrombolytics. A recent study by Dresden et al1 echo’d 146 patients with at least a moderate probability of PE. They found RHS on bedside echo to have an impressive specificity of 98% (and a sensitivity of 50%) for a PE. I am (obviously) a huge proponent of bedside ultrasound, and have personally used the presence or absence of RHS to manage sick patients. That being said, I think it is important to interpret that data with a small grain of salt. While they report a high specificity of RHS for the diagnosis of PE, their only false positives were in COPD patients, and they didn’t include any patient with right heart ischemia. If you take your average patient that comes into the ED with chest pain (CP) or shortness of breath (SOB) you will see RHS more commonly in 2 other diseases than you will with PE. Those two diseases are right heart ischemia and COPD. When researching the number of PE’s seen annually in the US I found that the number 600,000 cases/year 2 seemed to be quoted a lot. The only problem is that the study that originally reported this only looked at PE’s in Worchester, Mass over a year. They found an incidence of 23 per 100,000, which if you extrapolate out to the US population comes out to 73,140 cases/year. They then go on to say “although based on more limited data, estimates that the true prevalence of clinically significant venous thromboembolism is at least 600,000 cases per year seem entirely reasonable.” So basically their 600,000 estimate is a guess. After I did my own research, the number is more likely somewhere between 220,000-350,000 a year. 3,4 If you assume between 25-45% have submassive or massive PE (and therefore RHS), that’s between 85,400 and 155,750 cases of pts with RHS due to PE per year. Approximately 720,000 patients have MI’s every year.5 Fifty-three percent of those will have an inferior infarction.6 Between 30-50% of which will have a right ventricular infarction (RVMI). 7-12 If you add all this up, it comes to 115,000 to 190,440 cases of RHS due to right heart ischemia per year. In my practice, COPD patients comprise the vast majority of those in whom I see RHS. After a literature search, I found that I wasn’t alone: 15 million people in the US suffer from COPD,13 and in 2010, 722,000 patients were seen in US emergency departments for “chronic or unspecified bronchitis”.14 If you take all patients with COPD, anywhere from 20-91% have cor pulmonale. 15-19 If you add those up, it comes to 144,000-657,020 cases of RHS due to COPD a year. Fortunately, there are ways to help you differentiate between the three. The most important one is the rest of your clinical exam and tests. If you have an EKG that shows inferior ischemia, highly consider MI. If you have an X-ray that shows severely hyperinflated lungs and you hear markedly diminished breath sounds, highly consider a COPD exacerbation. If the patient has unilateral leg swelling and sudden onset of symptoms, high consider a PE. There are also some sonographic findings you can look for to help identify which one of the three main causes of RHS your patient has. Stay tuned for the next blog post to learn how you can tell the difference. Dresden S, Mitchell P, Rahimi L, et al. Right ventricular dilatation on bedside echocardiography performed by emergency physicians aids in the diagnosis of pulmonary embolism. Ann Emerg Med. 2014;63(1):16-24. Rahimtoola A, Bergin JD. Acute pulmonary embolism: an update on diagnosis and management. Curr Probl Cardiol. 2005;30:(2)61-114. Wiener RS, Schwartz LM, Woloshin S. Time trends in pulmonary embolism in the United States: evidence of overdiagnosis. Arch Intern Med. 2011;171:(9)831-7. Silverstein MD, Heit JA, Mohr DN, Petterson TM, O’Fallon WM, Melton LJ. Trends in the incidence of deep vein thrombosis and pulmonary embolism: a 25-year population-based study. Arch Intern Med. 1998;158:(6)585-93. Hreybe H, Saba S. Location of acute myocardial infarction and associated arrhythmias and outcome. Clin Cardiol. 2009;32(5):274-7. Goldstein JA. Pathophysiology and management of right heart ischemia. J Am Coll Cardiol. 2002;40:(5)841-53. Isner JM, Roberts WC. Right ventricular infarction complicating left ventricular infarction secondary to coronary heart disease. Frequency, location, associated findings and significance from analysis of 236 necropsy patients with acute or healed myocardial infarction. Am J Cardiol. 1978;42:(6)885-94. Isner JM. Right ventricular myocardial infarction. JAMA. 1988;259:(5)712-8. Cabin HS, Clubb KS, Wackers FJ, Zaret BL. Right ventricular myocardial infarction with anterior wall left ventricular infarction: an autopsy study. Am Heart J. 1987;113:(1)16-23. Kinch JW, Ryan TJ. Right ventricular infarction. N Engl J Med. 1994;330:(17)1211-7. Weitzenblum E, Sautegeau A, Ehrhart M, et al. Long term course of pulmonary arterial pressure in chronic obstructive pulmonary disease. Am Rev Respir Dis. 1984;130:993–8. Oswald-Mammosser M, Apprill M, Bachez P, et al. Pulmonary hemodynamics in chronic obstructive pulmonary disease of the emphysematous type.Respiration. 1991;58:304–10. Scharf SM, Iqbal M, Keller C, et al. National Emphysema Treatment Trial (NETT) Group Hemodynamic characterization of patients with severe emphysema. Am J Respir Crit Care Med. 2002;166:314–22. Thabut G, Dauriat G, Stern JB, et al. Pulmonary hemodynamics in advanced COPD candidates for lung volume reduction surgery or lung transplantation. Chest. 2005;127:1531–6. Thank you so much for this article. It will be really useful.